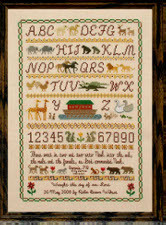 This sampler design is of assorted animals in pairs with Noah’s Ark, using all whole stitches. Rows of designs are between rows with capital letters and animals. Some of the animals are highlighted with backstitches. Petite glass beads are used for the animal’s eyes. The border is in basic nature colors, but they can be changed if desired.